This space is dedicated to John Haddock, author of "Growth of a Century," a centennial history of Jefferson county, printed in 1893. His goal was to convey to the reader not just dry facts and figures, but to offer a sense of the personality of the region and inhabitants he loved; therefore, much of the book was written in the first person and contains the author's impressions of people he met, not just their vital statistics. Haddock would be happy to know that his work remains indispensible to the curious more than 100 years later. As a second century of progress closes behind, may Haddock's efforts inspire us to record and to reflect upon the history that we have made and that which is yet to come. . . .
Family Background . . .
“Samuel and Sabrina Haddock were born in Herkimer county, N.Y., in 1804, married early, and in 1822 came to Watertown to found a home. Samuel’s father had been sheriff of Herkimer county, and had fair opportunities for education in the public schools of those days. Sabrina was a daughter of Rev. Asahel Barnes, an old-time preacher-without-pay Methodist minister, and it is somewhat singular that for over a hundred years continuously, there has been some one of this family in the Methodist itinerancy. [Sabrina's brother was Rev. 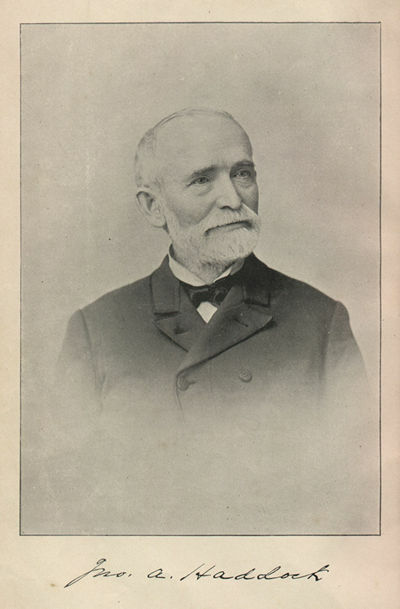 Enoch Barnes of Sulpher Springs]. Of Boyhood in Hounsfield . . . Generously contributed by Mary Martin <mbmart@earthlink.net>. © Design by Mark A. Wentling, 2000. Haddock, Jonathan A. The Growth of a Century: History of Jefferson County, New York, from 1793-1894. Philadelphia: Sherman & Co., 1894. pp 280, 583.